Today I want to talk about two pieces from the Nordlándda Collection that share a common edging - the wonderful, occasionally fiddley, applied i-cord edge. Rosta is one of the simpler pieces in the collection, with a wide panel of stockinette bordered by two loose cables, while Fauske is one of the more complex, with an intricate cable border and an expanding and contracting panel of a smaller, very traditional cable motif, but both use an applied i-cord to generate a tidy edging that won't roll or curl when you're finished. There are a couple of tricks for getting a nice i-cord edge that lies flat. 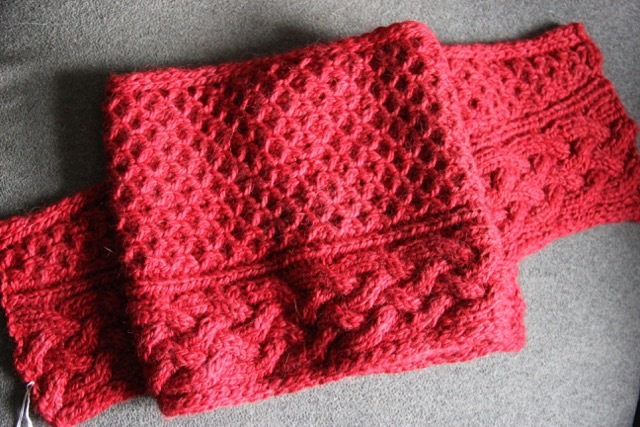 First off, for both of these pieces, the i-cord is made by slipping the last three stitches of every row. On the right side rows, the last three stitches are slipped purlwise with the yarn in back, and on the wrong side rows, the stitches are slipped purlwise with the yarn in front. In both cases, you want the yarn to be on the right side of the fabric for working the start of the next row. The other tip is to keep the i-cord stitches a little bit loose as you are knitting, Because the i-cord is only worked every other row on each edge, if you work those stitches tightly, the i-cord will be shorter then the rest of the piece, and your finished item won't lie flat when it's blocked. Be careful to leave a little extra slack in those three edge stitches, and you should end up with a beautiful finished edge. Please come join us in the A Yarn Story #AYSWInterCablesKAL on Ravelry - Carmen has some gorgeous prizes lined up, and we'd love to see your take on the Nordlándda Collection! Note: If you are in Europe and would like to purchase one of the patterns from the collection without paying VAT, please go to the Nordlándda page and be sure to include your Ravelry ID (if you have one) when you check out. The pattern will be emailed to you and put into your Ravelry library. Thank you!